We’d guess no less than 4 hours in the cage, two tournaments among several different hitters, the Little League World Series, consulting our 2015 and 2016 Easton MAKO reviews and our 2017 Easton Lineup to put together this review. We aren’t the only ones to have information about the Mako Beast. Other places, in particular those who sell bats, usually have a boiler plate write up on the specs of a bat. Many of those we reference to make sure we are seeing what we should be. Here are some more references for the 2017 Easton Mako Beast review. Frankly, there are few players for whom the Easton MAKO Beast is not a good fit. Here are the general type of hitters that will like this bat: want a top shelf performance and budget isn’t a concern; prefer a smooth swing; have time time to work in a bat’s barrel. The USSSA bats are really liked among travel ball players. 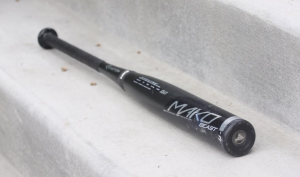 While other bats are getting banned from this year, the Easton Mako Beast is a mainstay. Not much different than last year’s version, but if you can find it for a good price we say go for it. Compared to the 2016 Easton MAKO we didn't find any remarkable changes (at least in the 2 5/8 version). Easton has claimed in a few YouTube videos the Beast barrel is the 'hottest' ever and such a claim would be impossible for us to measure. Some have written to us claiming the compression tests on the Beast's barrel have come back different than MAKOs in years past. This would imply Easton has done something differently, but implying it now out performs a 2015 and 2016 version, which were straight out crazy hot, is too far fetched for us. The MAKO in the last several years has been the bat to beat in terms of on field performance. That will be no different for 2017. After 2 solid hours in the cage with Slugger’s 2017 917 Prime in tow we have a good grasp on its total performance, how it compares to it’s predecessor and what type of hitter will appreciate this bat the most. After considerable time in the cage, direct feedback from hitters at different levels of the sport and discussions about the upgrades with several in the know, we present our 2017 Rawlings Quatro bat review in both Senior League and BBCOR. Like previous years’ models, the 2017 Easton MAKO Beast is a two piece composite bat with a focus on a massive barrel and a light swing weight. However, in the BBCOR space, the 2017 barrel is larger than last year’s version. In the Big Barrel or Youth Barrel space, the barrel size will be the same. In both BBCOR, Big Barrel and Youth Barrel, the bat composition is still the TCT composite Easton has been using for at least a couple years now. The connective piece (CXN) is still reasonably stiff and allows for good vibration absorption without any noticeable loss in power.